Lynnsey, Nik, and Verda are music enthusiasts from Northeastern University here at our first hackathon! We came to HackBeanpot 2019 looking to meet some new people (and get to know some people better than before), learn new skills, and create a cool project we could all be proud of. None of us came in with a team or a definite idea we wanted to implement, but after we spent some time mingling with the other hackers who signed up without a team, a plan for what would become aesthetify began to take shape. Lynnsey started us off with the brilliant idea of using the Spotify API to glean data about songs and present it in a way that curious listeners would find informative and appealing. Coming from musical backgrounds as well, Nik and Verda found this idea very intriguing. We found that we all have different but complementary experience and interests in CS, and we had a great time collaborating with each other and the mentors at HackBeanpot who helped us with various difficulties we ran into along the way. aesthetify is a web application that graphically models various metrics about any song on Spotify. The user logs in with their Spotify account, searches for a song, selects the song they want from the search results, and sees relevant data about the song modeled in a simple, elegant UI. The metrics we chose to focus on are the popularity, key and mode (e.g. G major), meter (e.g. 4/4), tempo, 'danceability', energy, 'acousticness', 'instrumentalness', 'liveness', 'valence', and 'speechiness' of the song as a whole, as well as the loudness and tempo of all the segments of the song as a function of time. The Spotify API does provide plenty more data about their songs, but we thought these metrics were the ones a user would be most interested to see modeled graphically. We all did a little bit of everything, but Lynnsey and Nik worked mostly on the backend and Verda worked mostly on the frontend and design. 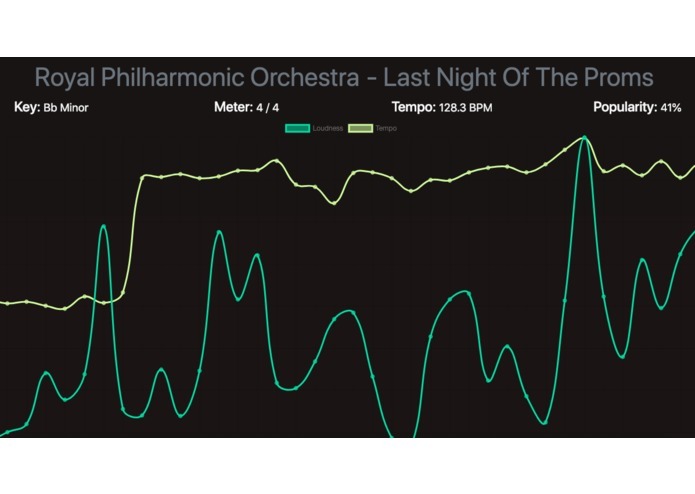 We used Python/Flask to get data from the Spotify API, and modeled that data visually using Chart.js. We made a beautiful, comprehensive visual analysis of songs that we can use to look at any song we want! As music enthusiasts we're really excited about that. We hope to expand our graphing functionality from individual songs to collections of songs, to show trends over albums, playlists, and even artists' whole Spotify careers.